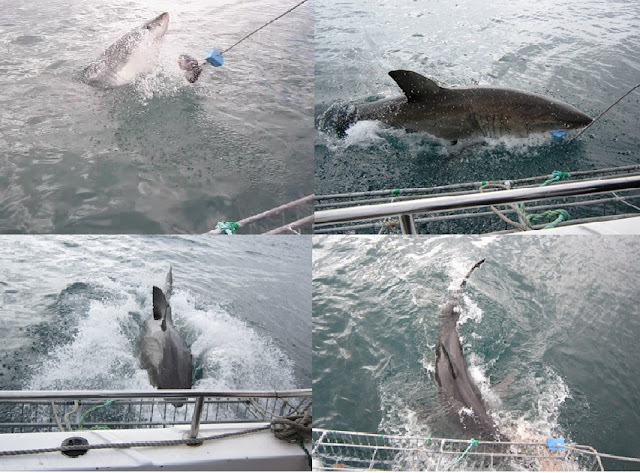 Since we have lots of time in Mossel Bay we decided to do a cage dive with great white sharks. There are a number of companies that offer this activity along this coast. It was great fun, but June wondered why there were no other people on the boat over about 35 - perhaps they are just more sensible than we are. LEFT The shark cage goes in the water. If you look closely you can see that it is pretty battered with most of the bars bent. We were about to find out why. The cage is set up with boat fenders so it floats with 18 inches or so air at the top. You stay above the water until the guy who is attracting the sharks with a couple of big fish heads on a line yells, 'Down', or 'Left'. Then you duck under to see the sharks. The best action happens above the water when the fish grabs the bait and holds on. RIGHT That is June at the extreme left of the cage getting ready for action. You can see how the cage is attached to the side of the boat. Some of the action shots. It was really hard to get the best pictures with a point and shoot since there is always a delay between when you push the button and when the image is captured. On a number of occasions, primarily when June was in the cage, a shark would crash into the cage, creating a few more bent pipes. The sharks we saw, about six in total, were in the 3 to 4 m range which does not sound like much until you are really close to them. They are incredibly powerful and impressive beasts. Many of them have scars and even raw wounds on them. I assume that they must bite each other, I can't imagine that anything else could attack them. At this time of year, great whites spread out along the coast and the biggest fish are away from Mossel Bay in search of food. In the winter, all the big ones congregate near a small island that has hundreds of seals on it. Posted by Bruce at 2:41 p.m.